The holidays are hectic. Moving is chaotic. Put those two important events together and you may find yourself huddled in a corner wondering how to make it through the next few weeks. 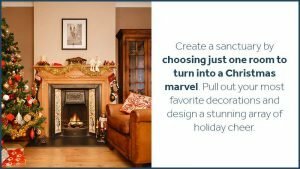 The Christmas season might not be the ideal time to move, but when that is the only time to get your family settled into a new home, then you have to find a way to make it work. Just because you find yourself surrounded by packing boxes doesn’t mean that you have to give up on the holidays altogether. You can salvage your Christmas spirit and create a peaceful and enjoyable experience for the entire family. Where should you start? Move and organize only what you absolutely must. You don’t have to set up every piece of furniture, unpack every box and hang every picture to make a place feel like home. Think must-have living until the holidays are over. In the meantime, let Zippy Shell of Columbus take away and store all of those other boxes cluttering your hallways. Our portable storage containers are a wonderful way to get all of that clutter and mess out of your house — and off your mind — until you have the time to deal with it after the holiday rush. Leave projects for later. Anytime you move into a new place you want to change something. Don’t begin any projects until after holiday season. Trust us. Keep holiday decorations simple. Life is busy right now, so don’t add to your stress by trying to decorate. Sure, put up that Christmas tree or hang a few lights on the porch, but leave all of that extra decorating fuss for another year. Don’t volunteer for anything. This is not the year to volunteer to help at the local church bazaar, school party or hospital caroling. Sometimes saying no is just what you need to give yourself the chance to take a breath and enjoy the holiday with your family. If there is one thing most people can say about Christmas, it’s that it is a time of overindulgence. Avoid overload by choosing just one (or maybe two) of your favorite activities or traditions and enjoying them. Maybe you couldn’t imagine the holiday season without attending a certain concert or allowing your children to participate in the community Christmas play. That’s OK. Some traditions make the season extra special. The goal here is to choose only one or two things that will give your family joyous memories without overloading everyone trying to do it all. Have pre-printed Christmas cards made at your local print shop. Include a family photo in your new home! Hit the local holiday bazaars in your area to stock up on special treats like cookies, fudge, and those yummy pies. Remember, homemade doesn’t have to mean made in your home. Shop online. It’s fast, it’s easy and it’s efficient. When possible, opt for gift wrapping too to save time and trouble once those special gifts arrive. Hire someone to come in and clean or even decorate for you. Take the family out for your holiday dinner. Don’t try and cook a fabulous feast this year. Instead, accept an invitation from friends and family, head to your favorite restaurant, or even have your Christmas meal delivered right to your doorstep. When it comes to enjoying the holiday rush in the midst of a chaotic move, the key is to think simple. Simplify every aspect of your life as much as possible. 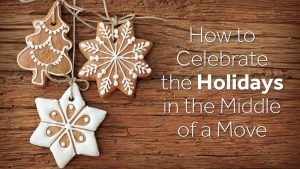 This may mean cutting back on a lot of activities your family is used to participating in this time of year, but you may be surprised at how smoothly the holidays go when you take the time to relish each special moment. One of the easiest ways to simplify your holiday move is to store away all of the stuff that can wait to be unpacked later in a Zippy Shell storage unit. These portable storage containers allow users to get all of those boxes out of their way while enjoying the holidays. Then, when life calms down a bit, you simply call Zippy Shell and have them bring the container back to your new home where you can take your time unloading it and unpacking your belongings. To find out more about the ways in which Zippy Shell can help make moving during the holidays easier, call the Columbus customer care center for a free consultation and list of current specials. Right now you can save up to $170 with our 12-month winter special!